You are here: Home / Investments / How to invest in Mutual Funds in India? Mutual Fund is considered a simpler and more preferable way to get some exposure in equity and invest in the stock markets. So How to invest in Mutual Funds in India? Let’s check out in this post. Before you invest in mutual funds, you need to have proper understanding of it. 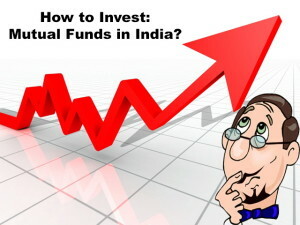 You can get a detailed understanding of mutual funds in India and how they function over here. Once you are ready to invest in mutual funds and get your equity portfolio going, you need to know what sort of investment options mutual funds provide apart from the flexibility and convenience over directly investing in shares. What are my investment options within the Mutual Funds? Mutual Funds come with mainly 3 investment options; Growth, Dividend and Dividend re-investment. Under Growth Option, whatever appreciation you earn on the fund value, is added to it and the entire fund value with the returns is received at the end of the tenure. This is a good option and should be chosen as a long term investment will give higher compounded returns compared to the other two options. Under the Dividend Option, the mutual fund house will make periodic payouts to the investors depending on the appreciation of fund value. This option should be chosen if you want some sort of a money back scheme, where in you keep getting certain amount in between, during the tenure of your investment. This dividend payback is not guaranteed as it is market dependent and performance based. Also the other drawback is, with every dividend payout, your returns on maturity are reduced, as it is with most money back schemes. Under Dividend Re-investment Option, whatever dividend the company declares, will be utilized to purchase more units in the same fund and thus you can purchase more units without investing additional money. It is like the fund itself is earning and purchasing additional units. But as it is dividend based, this reinvestment can vary and is again dependant on fund performance. Generally speaking, Growth option should be your first choice for making any investment in Mutual Funds as it will not make any payouts and all the appreciation in the fund value or the returns earned will be added to your eventual corpus on maturity. This will give you the benefits of compounding and give more returns. Also dividend re-investment is a good option as even though it distributes dividends, that amount will again purchase you additional units in the fund. Dividend option should only be taken if you wish to have some sort of money back investment or as a means to some variable additional income. Investment Advisor: Traditionally in India we always take advice from friends and family or some finance advisor. Same can be followed for mutual fund investment in India. You can ask someone you trust who has invested in mutual funds before or your finance or investment advisor, to guide you through the fund selection and the process of investing in mutual funds. Banks: You can also do it through your banks as lot of banks partner with lot of fund houses and will help you choose a mutual fund to invest in. Also Read: How to invest for your child? Fund Houses: You can contact the fund house or AMC itself, by visiting their website. If you do not know the website, just Google it and you will have all the details and you need to just contact them and in most cases their representative may contact you for further process. Demat: In case you have a Demat account, you can even do it online through your demat account. KYC: For mutual fund investments in India, SEBI has made it mandatory to have KYC process done for all its applicants. KYC is Know Your Customer and you need to have done this procedure to be able to invest in Mutual Funds. However, worry not as if you are a first time investor without KYC, the medium through which you are investing in the mutual fund India i.e. Investment Advisor, Banks, Fund House etc., will help you through it. PAN: You need to have a PAN for this as well as for investing in Mutual Funds. So before you think of investing in Mutual Funds, get yourself a PAN. Make sure to research about the fund you invest in, even if it is advised to you by you finance advisor or bank. Check the average rate of return of the fund for the last five years. Again, Google the name of the fund you are interested in and type ‘last 5 year performance of fund ABC in India’. You will get the results and also you may get other related funds to compare the performance. Also check the performance of the fund when the markets were down. Compare 4-5 funds and then decide on one. Also Read: Understanding Mutual Funds: Beginners guide to mutual funds in India. Investment options in Mutual Funds? You can invest in mutual funds either regularly via SIP or Systematic investment plan or lump sum payments as and when you have funds. However, it is advised that SIP should be the way to go as it will work on the law of averaging and your losses and profits will average out in the long run, giving you better returns compared to lump sum investments. It is said that one should buy more when the markets are low and less when the markets go up. Also what to buy is important. All these things are taken care of by Mutual Funds in India and particularly SIP. In an SIP you invest a fixed amount every month irrespective of market volatility. So if you invest Rs. 1,000 monthly, when the markets are low, you 1,000 will automatically purchase more and when they are up, the same 1,000 will be able to buy less. Mutual Funds will have professionals handling your investments; hence you need not have to be a share market expert. However, remember to check the fund performance for last 5 years and compare the rate of returns before investing. You financial advisor may also guide with the same and Google it to be sure. Happy Investing!!! Hi I’m immature in this Field. I’m soon going to start my professional career. I want to invest my part of salary. Please suggest best way to start my journey on this field. Can,anyone tell me how to start,, if I want invest only 500-800per month. Mutual Fund SIP are the best option for this. Other is opening a Recurring Deposit in your bank. i am a student and currently thinking of investing 1000 per month in MFs but i am kinda worried that the money will go down. Is there any guarantee that the company will give a certain percent of interest even of stock market goes down ?? Mutual Fund SIPs are advisable for the long-term investment – 5-7 yrs atleast. Also, there is never a guarantee of the interest, since the MF works on NAV – net asset value, and of the NAV goes down, then your fund’s value also goes down, and if it goes up, the fund value goes up. However, this only matters if you are selling during the phase when the NAV is down – otherwise the ups and downs of the market would only affect the fund value on paper and your SIP will still continue for the same amount you had started – INR 1,000 every month. Generally, it is observed that a good MF gives great returns, way above the bank FDs and other such investment options in the long-run. Mutual Funds are for those who are OK to wait for long. If someone needs quick returns, this is not the option for them. Before investing, always check the fund’s performance over the last 5-10 years. A consistent performance for such a long term, means you can expect good returns on your investment in that. I have 5 more years of service to retire. I have Rs 5,00,000 and intend to invest to take care of my life after retirement. Can you pl suggest me good mutual fund schemes? You can divide your investment budget among Balanced mutual funds and some debt funds. The reason I am not suggesting equity is that one, you have to hold it for atleast 10 years in today’s market to get decent to good returns and secondly, you have 5 years to retire and in case of a setback or a loss from equity, it won’t be good. I m new to the market. Ur inputs r valuable. Thanks. Glad to have helped. Do explore the site for more beneficial info. I started my professional career this month. I wanted to plan my investments. As I am a beginner in this, I found your information very helpful. Please suggest me some tips so that I can plan my investment from my first salary only. While investment advice varies from person to person, I suggest you go through these posts to get started as a beginner and explore your options..
the bst website ever seen on internet.keep going frnds. This means a lot to me. Thank you so much for the kind words. Hope to see you on the site again. Thanks, Sir. The above article in just one page and in simple words has given basic ideas on how to invest in MF. Glad to have helped you. Do come back for more. I was so confused reading jargons used by various finance guys in understanding MF at various websites but your One page write up has given me enough clarity. Bang on…..Pizza and chef example is brilliant. Keep on writing brother and help us poor souls in finance. I have read many articles for investment guidance on Google. And out of many I really got the clarity and a final decision after reading your 4 parts article on beginners guide for an invester. Thanks alot. It makes me so happy to read the kind words you have written for the post. It is one of my early posts and very special to me. Thanks for appreciating the efforts and glad to know it could be of any help to you. Easy to understand,especially for begineers. Thanks a lot for the words of appreciation. It motivates me further to keep going. Also am very glad to know it helped you in some way. Will be a regular reader of this site , you’re doing a great job ?? Thank you so much for the encouraging words. It really motivates me to keep going. Hope to see regularly on the site. I have been looking for investment source to compliment my salary and narrowed down on mutual fund investments after talking to friends. Your 2 introductory articles have given me very good clarity and also clarified some questions i had on investments. Thanks a lot for these encouraging words. This is the kind of motivation that keeps me going. Thanks a lot. Very helpful! Info is very well laid. Thanks! Thanks a lot for the encouraging words. That keeps me going and encourages me to write further. Thanks once again. One time investments needs long term holding to show some decent returns. You can search online as to the top 10 best mutual funds for last 5 years, and see the ones that have given high returns in the last 5 years and pick any from them. Is the Growth option similar to fixed deposits?, i.e. you are guaranteed a certain amount + compounded interest at the end? or are growth options also subject to market risk? Growth option is also subject to market risks. The only thing is it is likely to give you more returns compared to the other options since the compounding benefit is higher as you won’t be withdrawing anything in between. There is no guaranteed returns like fixed deposits. There are certain capital protection funds in the market that give you the guarantee of atleast not letting your invested amount go in the negative. Beyond that they cannot guarantee returns. Good post!! Was planning to buy some equity mf’s by mode of SIP. This will be a help to my decisionmaking. Good to know the post was useful. Thanks, come back for more.